The much-hyped new beer, Bud Light Platinum, from Anheuser Busch InBev has finally hit shelves. 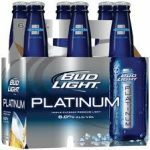 Bud Light Platinum has 6 percent alcohol by volume and 137 calories. In comparison, top selling Bud Light has 4.2 percent alcohol by volume and 110 calories. Budweiser, meanwhile, has 5 percent alcohol per volume and 145 calories. Some industry analysts say the new Platinum beer may turn out to be a “faux-spirit infused beer,” such as Bud Light flavored with a hint of tequila, a move toward the faster growing craft beer trend. As overall U.S. beer sales by volume dipped 1 percent in 2011, the craft beer industry grew by 11 percent, the Brewers Trade Association reports. The new beer’s bottle sports a blue and gray label, similar to the Bud Light Label. It comes in time for the Super Bowl on Sunday.